Huangdi The Yellow Emperor is a Chinese hero and Microgaming have captured him in their 2017 real money pokie. Although many of Microgming’s more recent releases have been based on the 243 ways to win format, this Chinese culture based title features 25 paylines. The problem is, Microgaming has so many Chinese themed titles, what makes this one special? 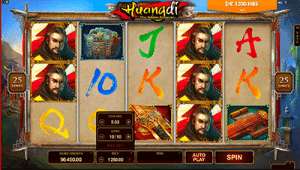 Huangdi The Yellow Emperor features 60,000 coins to win – depending on your max bets size. This 5 reel and 25 payline pokie is based on the Yellow Emperor, which can be known as the Yellow Thearch, the Yellow Lord, or simply Huangdi. He is considered be a hero who reigned between 2697 to 2597 or 2698 to 2598 BC. The reels are set in Ancient China, way up high in the mountains. Though you can’t tell this as easily as you can on other pokies due to the 5 reels and 3 rows being the star of the show. There’s also no quirky animations in the background – Microgaming has kept them to the symbols on the reels. While there isn’t much video animation to tell the story, Microgaming’s graphics do create a storyline of the battle of Zhuolo as Huangdi beats the Nine-Li Tribe – but you could only know this if you are a Chinese history buff. For those who aren’t you can still enjoy the incredible graphics and big payouts. Players can win up to 60,000 coins with the payout dependant on your bet size. Huangdi The Yellow Emperor has flexible betting limits for low-stakes and high-stakes players. 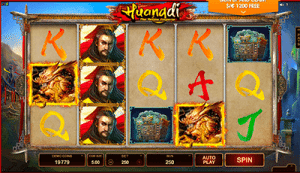 You can play Huangdi online via your browser or download the casino client for PC users at Royal Vegas Casino. The site offers $1200 in welcome bonuses and you can clear the wagering requirements attached by playing this pokie, among all the others. Players can bet a minimum coin size of 0.01 and a maximum of 5.00, with as little as one and as many as 10 coins eligible to be played. The paylines are fixed so we are left with a minimum bet of $0.25 and a maximum bet of $1250 – a title to suit any bankroll. AutoPlay is also available – you can customise it to automatically spin until a specific feature is activated or for a specified number of rounds. To play the game in real money mode, and for a chance to win real cash, you can make a quick deposit once you’re logged into Royal Vegas and get playing. Huangdi The Yellow Emperor symbol features are rewarding, but mostly standard-fare. Microgaming has stuck with their standard signature move with the traditional pokies symbols but the cool thing they’ve done here is made it look as though the entire reels is based on brown paper and the 10 to A symbols have been painted on with bright colours. These are the low paying symbols and you need at least three of a kind for a payout. The rest of the symbols don’t look like they’ve been painted on, instead they look like they sit on top of the brown paper, but they’re incredibly detailed. The middle paying symbols include instruments and medicine boxes, while the higher paying symbols include the swords and Huangdi. Both the middle paying symbols and the sword symbol can appear Stacked on reel 1, while Huangdi can appear Stacked on all reels. When a symbol does appear Stacked on reel 1 it will expand all matching high symbols on the other reels – they must be part of a winning payline. This feature also is available during the Free Spins feature which we detail below. The Scatter symbol is the dragon and is the highest paying symbol on the reels. Two of a kind will score you the minimum payout, while three of a kind will trigger the Free Spins – which is why we all play the pokies in the first place. The Wild also offers a payout with three of a kind topping up your account balance. It also performs its usual duty of substituting for all symbols except for the Scatter. 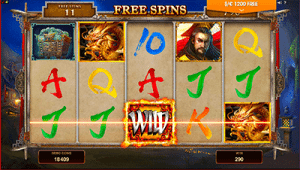 Unlock free spins to get increased scatters which multiply your stake by ten. As you play the game you’re aim is to spin at least three Scatter symbols anywhere on the reels. Do this and you will trigger the Free Spins feature where you are awarded 15 free spins. Spin four Scatters and you will score 10x your stake for each spin and five Scatters will reward you with a huge 100x times your stake. The Wild symbol is also Stacked and remained throughout the entire feature. If other Wilds appear they will expand and you will score a huge payout. There’s also the ability to re-trigger the feature by spinning three more Scatters – an additional 15 free spins will be awarded. This Microgaming pokie may have a standard traditional Chinese theme but the addition of Stacked symbols which expand makes it stand out from the other themed titles. While may be use to the Free Spins feature, the addition of up to 100x your stake is nice, though we only managed to spin three Scatters. We still won quite a nice amount and while this isn’t a truly special pokie, it is worth a spin. You can try this pokie for yourself at Royal Vegas Casino now.